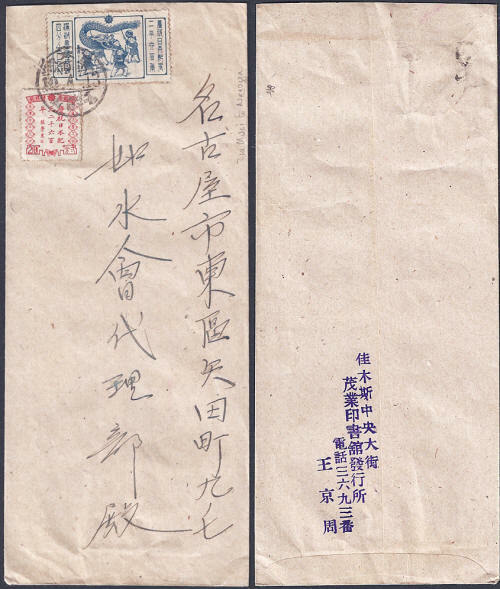 The above cover was posted on 13th April 1943 from the Post Office in 佳木斯 Jiamusi to Nagoya in Japan. At this time the 6f domestic letter rate was also sufficient to take a 20g letter Japan or Korea and so this rate is correct. The stamps used were issued on 19 September 1940 and commemorate the 2600th Anniversary of the Japanese Empire and the two stamps 2f and 4f make a complete set. This is a business letter with the address hand-stamp of the sender shown in purple on the back of the envelope. Nagoya was the centre of the war effort in Japan with large manufacturers such as Mitsubishi producing aircraft (such as the famous Zero fighters used at Pearl Harbour) and other manufacturers producing military hardware. A large percentage of all mail from Manchukuo to Japan was addressed to Nagoya, so covers such as the above are very common. This is a nice example of the First day Covers available from Hsinking Central Post Office. 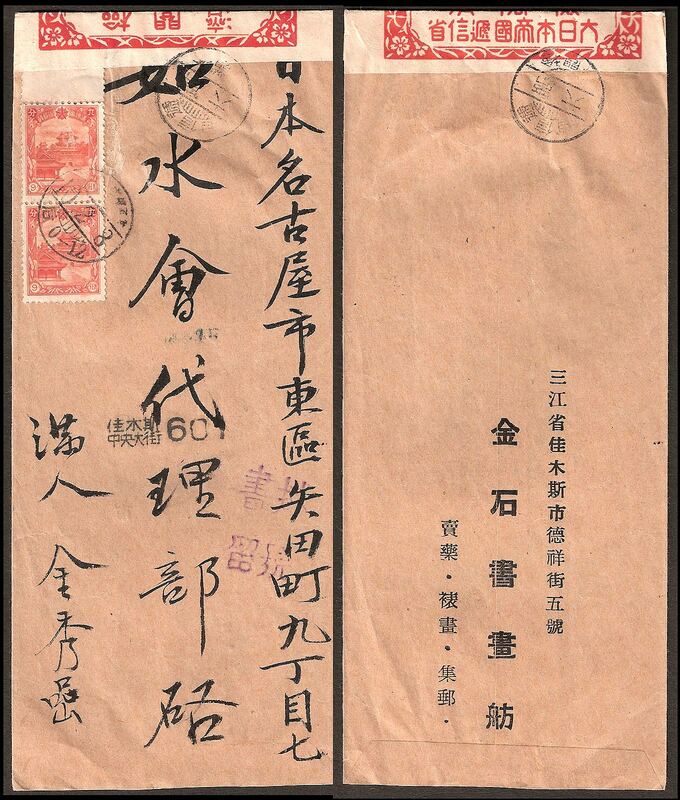 It was issued on 1st May 1943 to celebrate the Labour Law issue (more here), at the same time Manchukuo issued a special cancel to commemorate the first ten years of Postal Savings. 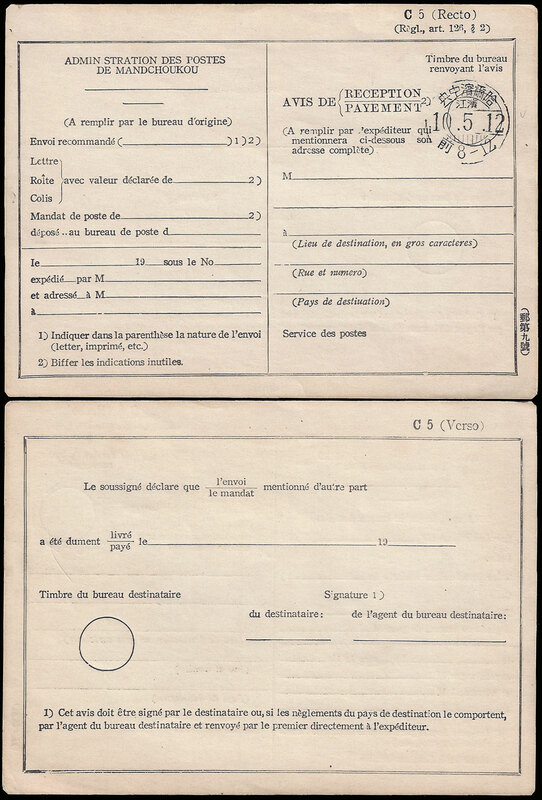 You may wonder why an 6f stamp was chosen to be placed in the top right-hand corner and cancelled with the dater. My theory is that these covers cost the collector a total of 15f payable to the main Post Office in Hsinking. 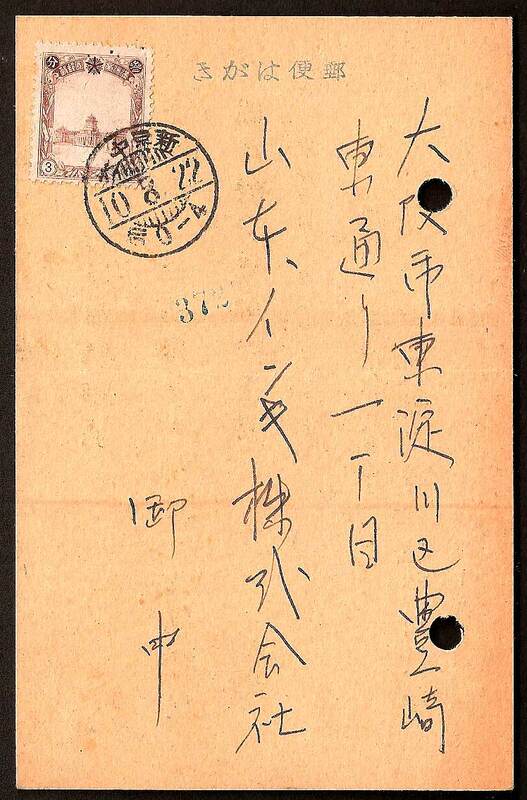 The postmark shows that this cover was posted on 28th June 1943 from 奉天青葉町 (Feng-t’ien Ch’ing-yeh-t’ing) Mukden Green Leaf Path Post Office to Japan. Note that, unlike the cover below, it has not been censored. This makes me believe that maybe the checking of mail at this time was random and only a small percentage items were opened. 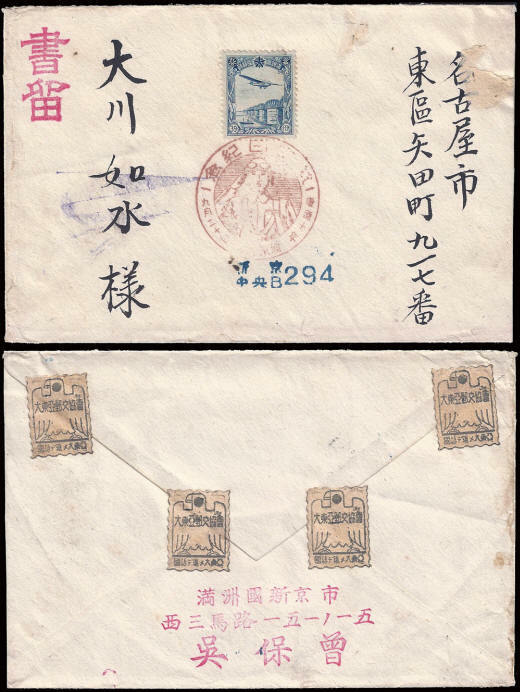 The cover carries 3 x 6f stamps of the 1942 First Anniversary of the Greater Asian War overprint issue giving a total of 18f. Letter post to Japan is 6f, Registration 12f. There is no arrival postmark so the transit time is unknown. This cover was sent from Hsinking Central PO "B" to Okawa in Japan on 20th September 1943, as shown by the special Aviation Day commemorative cancel. The letter was registered and bears the blue 新京中央 B 294 registration marking and the remains of the torn off registration slip. The purpose was purely philatelic and the sender must have been a little disappointed that the commemorative cancel is less than perfect. The blue 39f stamp shows an aircraft which is why it was chosen, it has little to do with the actual postage price which would have been 18f, 6f letter rate + 12f for registration. 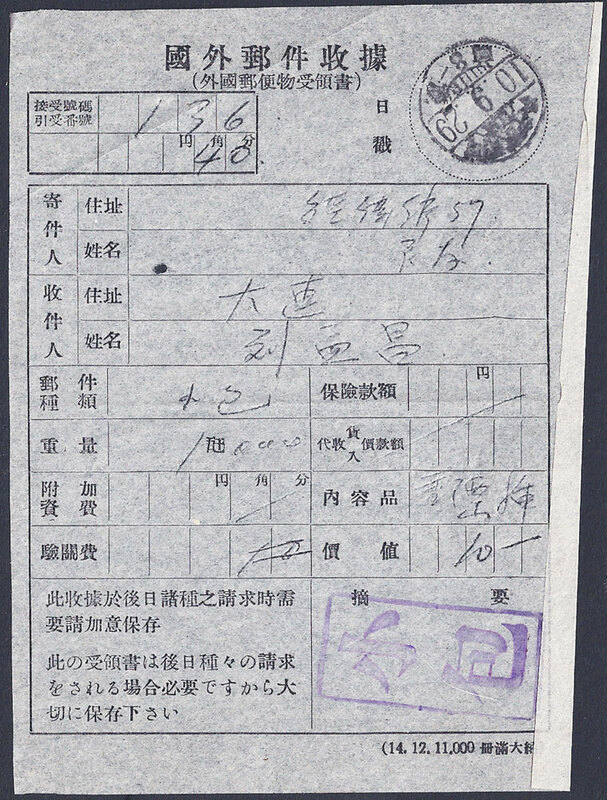 The seals on the back are interesting, they were to do with a special language police set up to ensure the proper use of the approved form of Japanese language. Use of dialects was forbidden and harshly punished, indeed during an uprising in Okinawa people were shot because they persisted in using dialect. 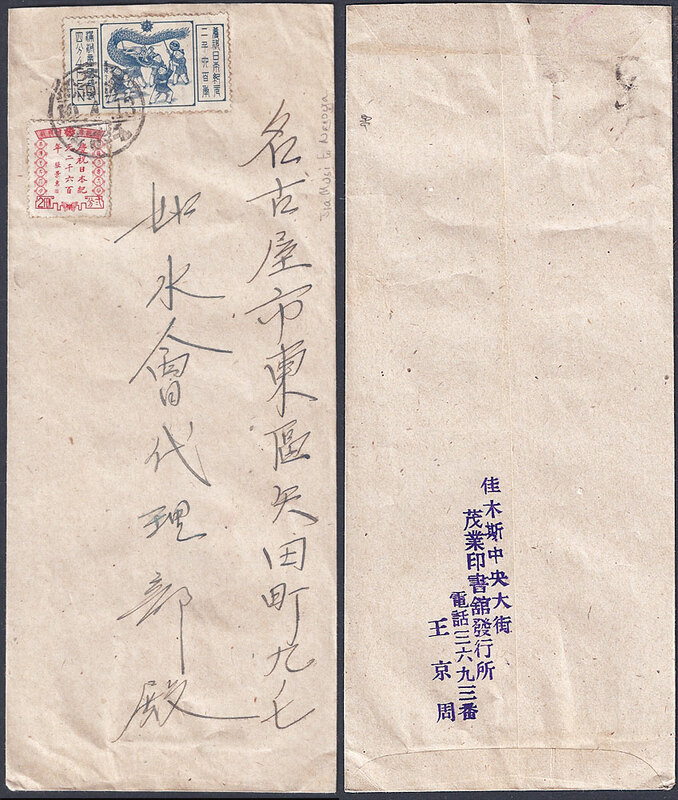 The above cover was sent from Yingkou to Japan on 28th December 1943. It travelled at the standard letter rate of 6f. Like most mail from outside Japan it was censored and sealed with special tape. 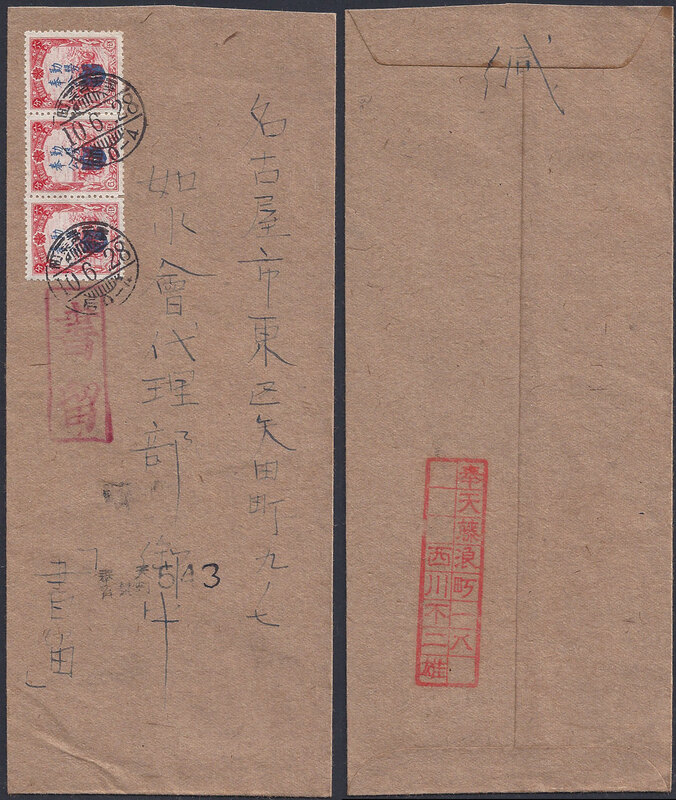 Censor number 4 applied a postmark to the tape to show that it had been officially sealed. This is an interesting for various reasons. 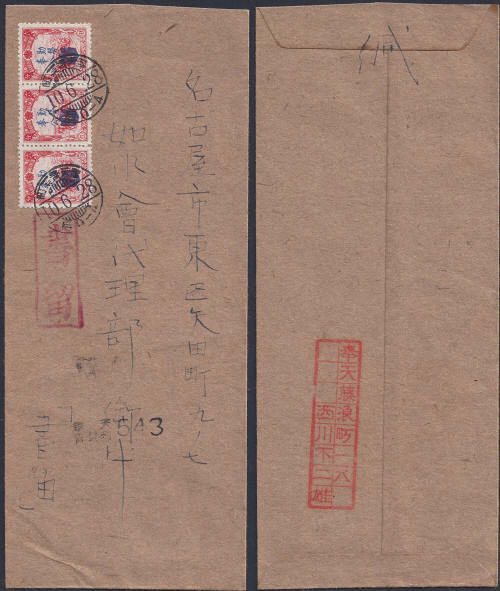 The reverse of the covers shows the address (in Japanese) of Constantine Dourneff a dealer in Tokyo, Japan. 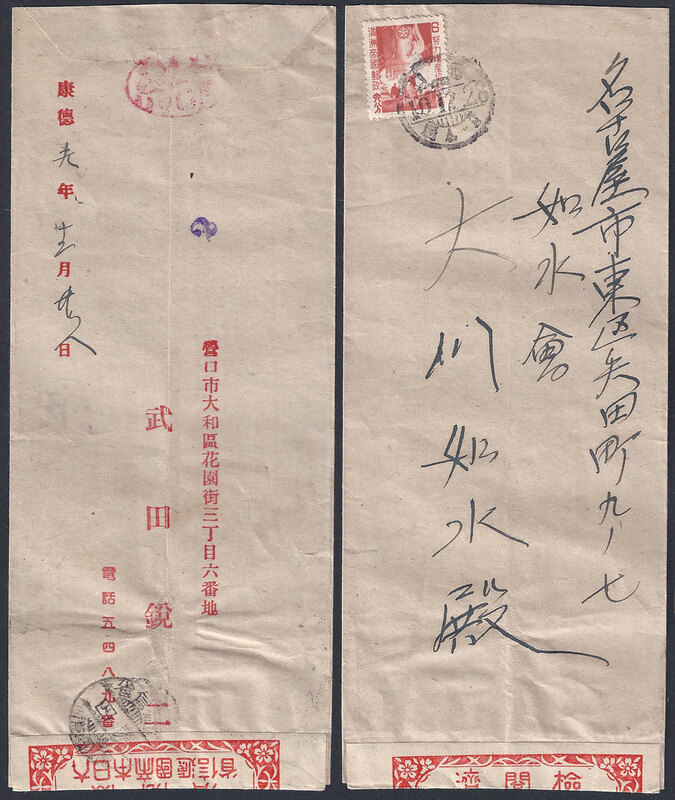 It is probable that Dourneff employed his agent V. E. Kauffman in Harbin to post these covers on the issue date. 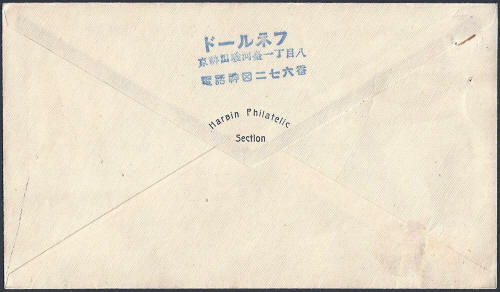 The reverse of the envelope shows the words "Harbin Philatelic Section". 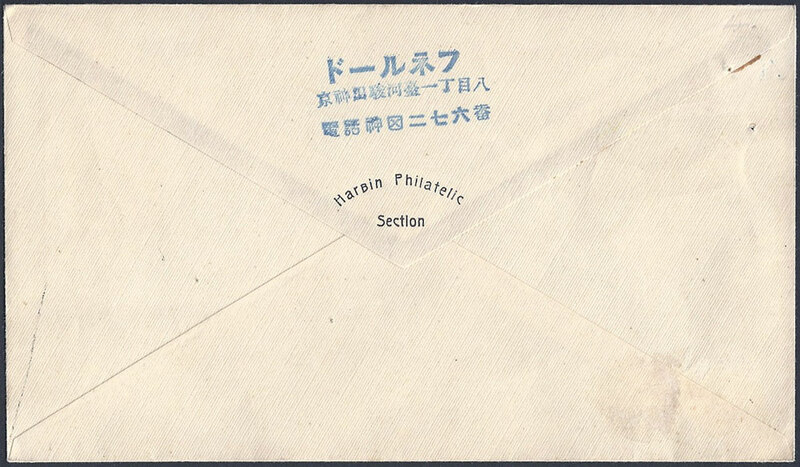 The "Harbin Philatelic Section" is really the Harbin Philatelic Club which was a section of the Harbin Commercial Club. The Secretary was John V Sweet another well known stamp dealer. 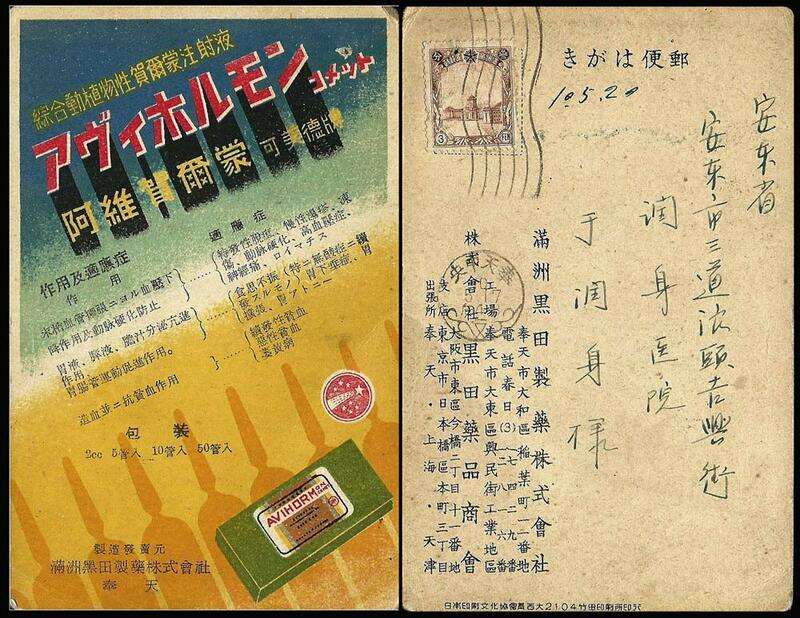 This cover was posted on 8th February 1943 in Jiamusi. It carries the violet Chinese/Japanese hand-stamp reading "Registered" and a registration hand-stamp reading 佳木斯 Jiamusi 中央大街 Central Avenue 601. The letter is addressed to Nagoya in Japan and carries Japanese censor tape to show that it has been officially opened. The stamps used are 2 x 9f 4th regular issue giving a total of 18f. Letter post to Japan is 6f, Registration 12f. There is no arrival postmark so the transit time is unknown. 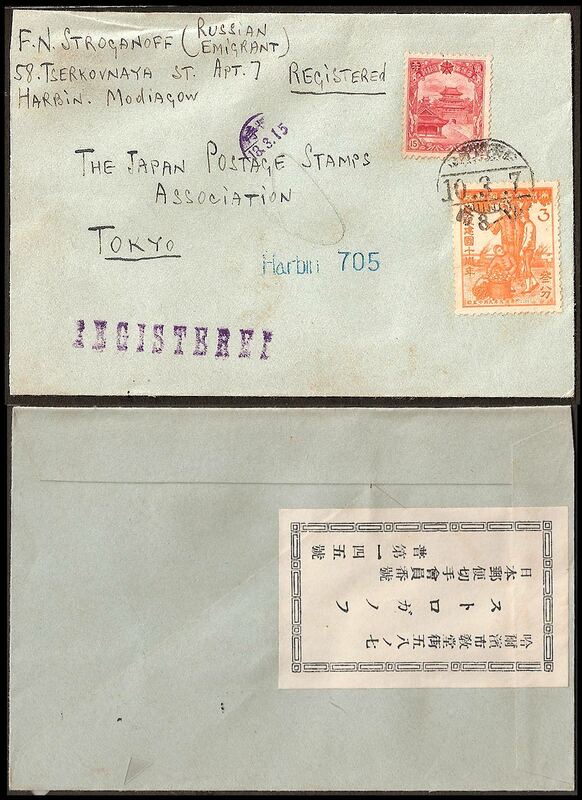 This cover was sent by the Russian stamp dealer F. Stroganoff to the Japanese Postage Stamps Association in Tokyo. The cover carries a "REGISTERED" hand-stamp in violet and the registration "HARBIN 705" in blue. 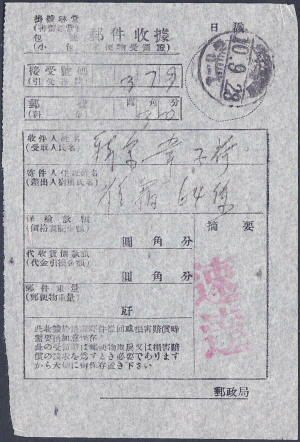 The white label reads 日本邮便切手会员番号 Japan Postage Stamp Association Member Number containing the above address and other details. The letter was posted on 7th March 1943 and if the private hand-stamp dated 15th March is correct it will mean the transit time was 8 days. The letter carries a 15f and 3f stamp, making 18f this is the correct postage rate - letter rate 6f + 12f for registration. 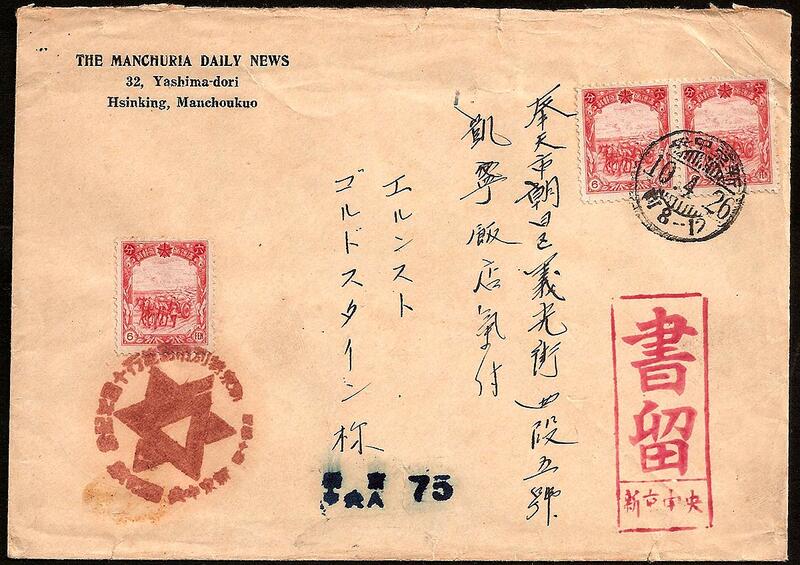 The Manchuria Daily News despite its name was issued twice a month. In 1931 it was acquired by a subsidiary of the South Manchurian Railway and was liquidated in 1945 at the end of the war. 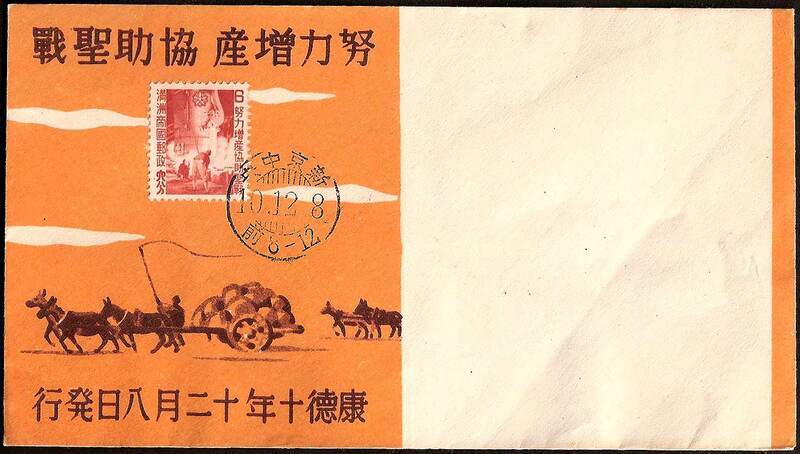 This cover was sent from Hsinking to Mukden. It features a red boxed "Registered" hand-stamp together with a standard and commemorative cancel all from Hsinking Central Post Office. The postage is correct at 6f for the letter rate (to 20g), plus 12f for Registration. 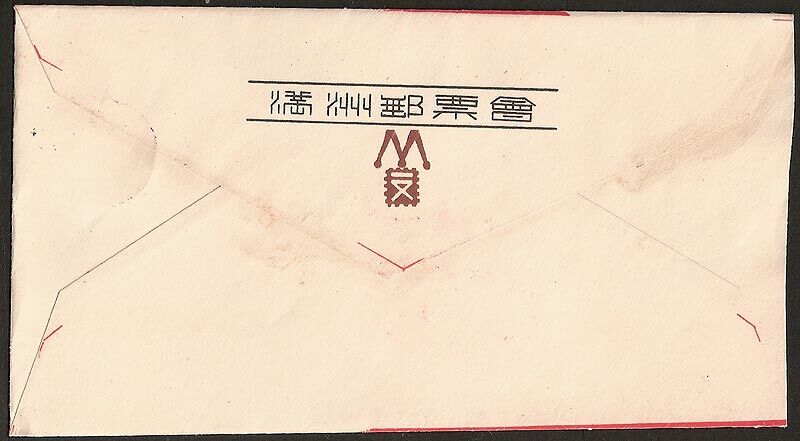 This is an advertising postcard posted in Mukden on 17th May 1943, the postage of 3f was correct for the time. Chinese characters read: AVIHORMONE comet, the characters here are used for their sound (not their meaning) to transliterate the term. Avihorm Comet was a general cure-all which worked for sporadic gangrene, chronic eczema, chilblains, arteriosclerosis, high blood pressure, neuralgia, rheumatism and gastric problems. The card explains that it comes in packages of 5, 10 or 50cc tubes. (outline of row of tubes in design on bottom of card). Makers Manchou Kuroda Seiyaku KK, Fengtian. My thanks to Richard Arent for this interpretation. 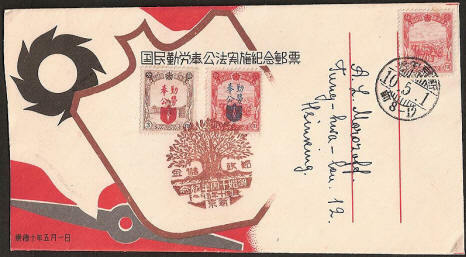 Postcard from Hsinking to Japan. 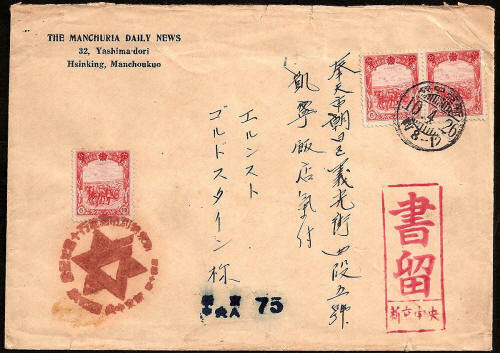 This is a standard blank Japanese Postcard sent from Hsinking to Japan using a 3f, fourth Regular Issue stamp from Manchukuo. The correct fee for this time. 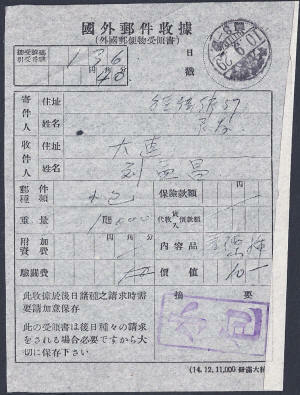 The Hsinking Central Post Office cancel is dated 22nd August 1943. 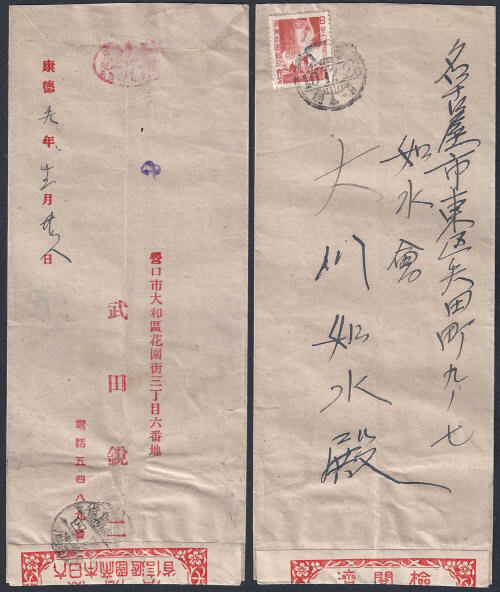 This is an official envelope issued by the Post Office of Manchukuo for use as a First Day Cover. To see the reverse side click here. 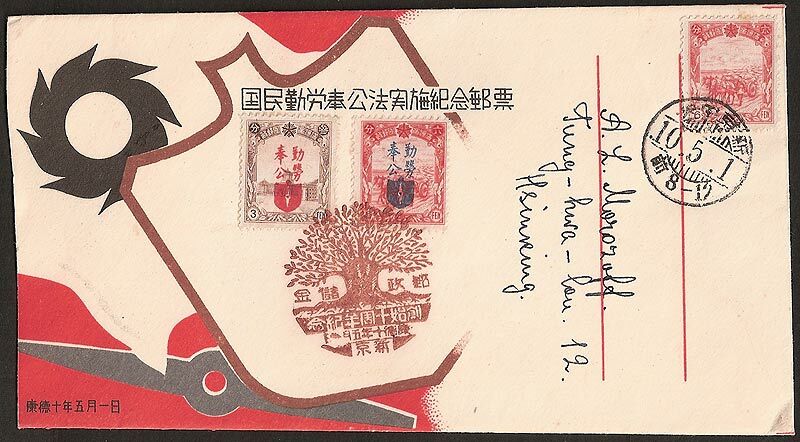 The design features the spade and pick-head reflecting the emblem overprinted onto the stamps. Afran Stamp Company First Day Covers. First Day Cover with Commemorative Cancel - Hsinking Post Office. (Zirkle 84) 1st October 1943. 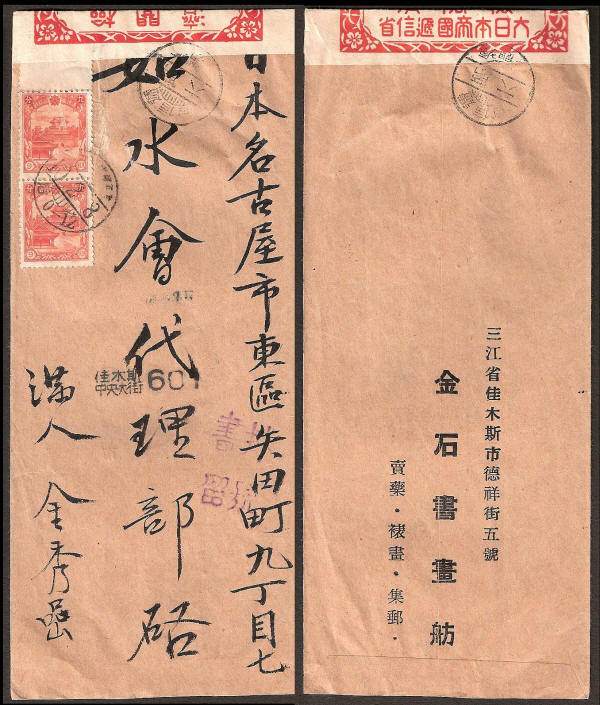 Fifth Anniversary of the establishment of the Red Cross in Manchukuo. This features orchids (the national flower of Manchukuo) and a cross, this is the emblem found on the Manchukuo Red Cross Medal. 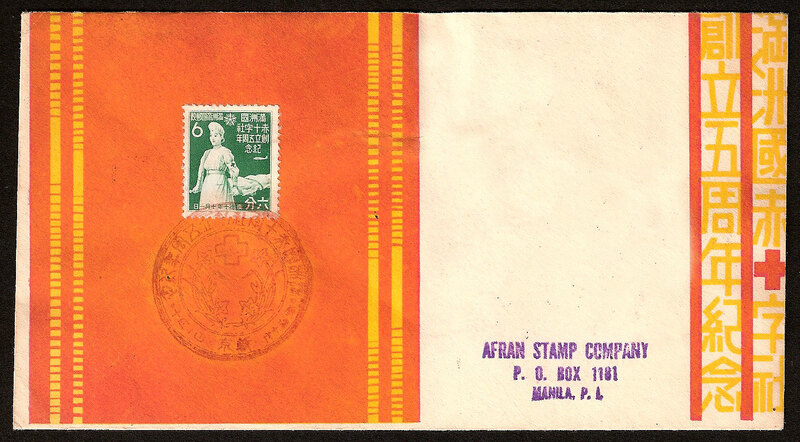 The Afran Stamp Company of Manila seem to have distributed a huge number of these covers (perhaps in co-operation with the Red Cross). It likely that these covers were sold to the many US servicemen in Manila after the war. A catalogue from the Afran Stamp Co issued in 1945 lists these covers at a price of 50c, below is an extract from the Afran Catalogue. 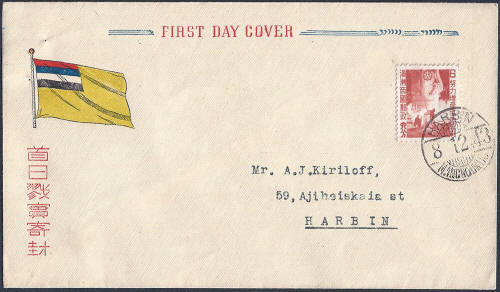 First Day Cover cancelled by the Hsinking Central Post Office I suspect that the Afran Stamp Company was also responsible for the distribution of many of these covers. The listing in the 1945 Afran Stamp catalogue is shown below. A Selection of 1943 Registered Post Receipts.